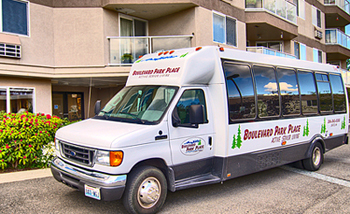 Boulevard Park Place is a family-owned, independent, Senior Community located in Burien, Washington. It was designed, built, and opened in 1996 by Merle and Vi Steinman. The family continues to be involved onsite each and every day. Visit us in Burien. Join us today! The mission of Boulevard Park Place remains unchanged: To create and maintain a safe, comfortable, and caring environment for Seniors. Throughout the years, our focus has always been our residents welfare. We provide a comfortable, independent living environment for our residents. Over 22 years ago, the ambitious dreams of Vi and her late husband, Merle Steinman, resulted in the amazing senior community we know and love as Boulevard Park Place Retirement Community. Merle’s idea was conceived when their parents were searching for a place where they could live independently without worrying about yard work and home maintenance. A big difference from other senior communities is that at BPP, the residents enjoy cooking their meals in their own kitchen. A true labor of love, the Steinman’s built three residential buildings with high quality, well-appointed living spaces, large common areas, multiple activity rooms, fitness center, craft rooms, wood shops, beauty/barber shop, libraries, and an indoor pool and spa. Family pride is evident in the gorgeous 10-acre community. Enjoy peace and serenity while strolling the pathways around the gardens and fish ponds. Aside from the buildings and amenities, what makes this place uniquely special are our residents, who truly become your family of friends for years to come!